The Elysium Ensemble’s standing as one of Australia’s finest chamber ensembles and its important contribution to the Early Music Revival in Australia has been recognised by two entries in The Oxford Companion to Australian Music (Melbourne: OUP, 1997). Baroque performing ensemble formed in Melbourne by Baroque flute and recorder player Greg Dikmans. Since its inception in 1985, the ensemble has presented an annual concert series in Melbourne and has performed at festivals and in concert halls throughout Australia. Based on a stable core of players, the group varies in size according to repertoire and thus has the flexibility to alternate between chamber music and works of orchestral proportion. Repertoire includes works of the 17th and 18th centuries, including early 17th-century Italian sonatas, French Baroque suites and cantatas, as well as larger works such as concertos, opera, and cantatas by J.S. Bach, Handel and Vivaldi. 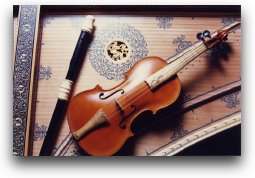 European interest in performance of Medieval and Renaissance music and the related growth of the historical performance movement have inspired from the late 1960s a small but dedicated group of early music exponents in Australia. The nine-member *Renaissance Players (founded 1966) under Winsome Evans in Sydney were among the first to record and perform early repertoire extensively in Australia; they were followed by the four-member *La Romanesca (founded 1978) under John Griffiths at Melbourne, who explored Medieval repertoire in particular. Baroque performance on period instruments and with attention to authentic styles was presented by several groups, the string trio repertoire by *Capella Corelli (founded 1977) under Cynthia O’Brien at Canberra, works for flute and recorder by *Elysium Ensemble (founded 1985) under Greg Dikmans at Melbourne, and early keyboard works by John *O’Donnell in Melbourne, who later gave stylish performances oof Baroque choral works with the Tudor Choristers and of 16th-century repertoire with his Ensemble Gombert. In the 1980s Nicholas *Routley gave performances of high quality with his Sydney University Chamber Choir, Geoffrey *Lancaster specialised in fortepiano, working extensively with the Tasmanian Chamber Players, and the *Brandenburg Orchestra (founded 1990) under Paul Dyer at Sydney has done increasingly impressive work. NOTE: Greg Dikmans has collaborated and performed with all the groups and individuals highlighted in bold. He was a member of the Renaissance Players from 1973-1977, joining while still in his final two years of school. John O’Donnell was the first harpsichordist to work with the Elysium Ensemble.